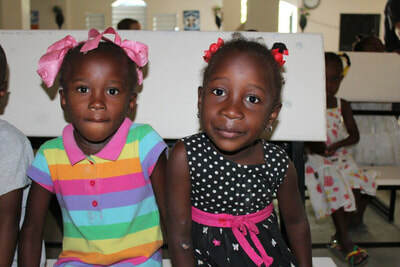 -Throughout the week a majority of the students on our trip went from butchering the little bits of creole that was taught to us in the mornings, to sharing laughter and lunch with Haitian youth leaders as we exchanged English and creole phrases over two-foot-tall preschool craft tables. There, youth leaders were anywhere from 11 to 20+ years old, and it was during these lunchtimes that were able to watch them interact with each other. It was incredible to see that they were the exact same as us. They teased each other about their ball playing skills, gossiped about boys, and every youth leader there chose to help in the VBS to share the love of God alongside their brothers and sisters in Christ. -Worship is universal, and we soon discovered this when the songs the children sang were the same songs we sang in our awkward preteen stages growing up. Songs like Open the Eyes of my Heart Lord, and 10,000 Reasons.​ During these times of worship, whether we were speaking in Creole or in English, there was an overwhelming unity as a single body of Christ. -The children as a whole were an incredible representation of what it looks like to have a child-like faith. We danced. We sang. We laughed. We painted. We did it in Jesus' name, and we said Amen. Sam and I lead through devotions this morning. After a week surrounded by screaming, dancing children (and college students) we thought it would be relevant to bring up the topic of rest and what that will look like moving forward. Rest is needed for all of us. This week has been emotionally, spiritually, and physically draining. Now is our turn to pray, to grieve the goodbyes of brothers and sisters and to have radical faith and hope in God's hand in this mission. 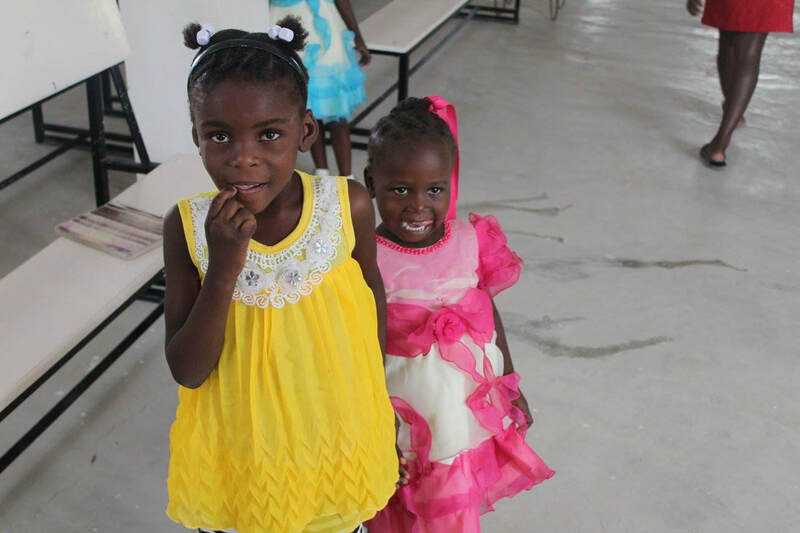 ​Please join us in praying for Haiti, for the children touched in this school, and in every person on this team that is returning to The States tomorrow. Pray that we could witness the short time that we had over here and proclaim the works that the Lord is doing. The Lords' heart is for Haiti just as it is the United States. We are His people. We are connected through His love, and by His love, He is made known. Thanks for reading all of this. Your prayers and support mean everything. This morning we sat up from bed, rubbed our eyes, and climbed out of our mosquito nets as we prepared for another day of VBS. We fueled ourselves with delicious pineapple, mango, cereal, and obviously coffee. We spent time in the Word and discussed spiritual battles, something our trip to Haiti has been full of. Next, Mary Jane started our Creole lessons, and told us we have officially made it to 3rd grade Creole! My favorite part of her Creole lessons is learning songs that we know in English so we can sing them with the kids at VBS. My favorite from today was 'I have decided to follow Jesus', because I so clearly remember singing that at VBS when I was a kid. ​Next, we headed out to meet with our Haitian friends to prepare for the day. We prayed over each other, our activities, and the beautiful children that would enter the gates of Living Hope Ministry within minutes. We all walked to the gates together and awaited the arrival of our favorite kiddos. As soon as the gates opened, they all ran to find their favorite one of us, with giant smiles on their faces. They leap into our arms, hold our hands, hug us, and ask us a slew of questions in Creole. This is by far the best part of the day. These kids are overwhelmed with joy, and it is so obvious that it is joy from the Lord. ​After they arrive, we head into the Chapel to sing songs and dance to prepare the kids for the day. After that, we walked to their individual classrooms, each with about four kids clutching our hands, and started our day. My classroom is led by one of the youths from the church, DJoulee. He has more energy in one day than I think I have in all of my life. He rallies the kids to sing 'Papa Abraham' (Father Abraham) and learn their daily Bible verse so well and he has taught me so much about how to love and care for these kids. His passion for the Lord is so beautiful and it reminds me of the Lord's goodness and faithfulness to us. He is one of the most incredible leaders for the Lord that I have ever met. ​After we have our individual class times, we meet back in the Chapel to sing more songs and get the kids together one last time before we send them home for the day. Today, one of the most amazing things I have ever witnessed occurred: the kids started shouting 'I have decided to follow Jesus.' It was a beautiful moment where I saw the Lord's faithfulness and guidance in my own life that has brought me here, to Haiti, where I get to love and cherish more of His children. ​The Lord has blessed my week with these children more than I could have ever asked. He has revealed so much to me about Him, my relationship with Him, and His heart for all nations that goes beyond all I can imagine. The day started out with an early rise, an invigorating cold shower, and some quiet time on the roof overlooking the mountainous terrain of Haiti glowing in the first light of the dawn. And all this before breakfast! It's such a magnificent way to start out the day. We had a breakfast of cereal, some leftovers, and some much-needed coffee. Mary Jane warned us that Wednesday is usually the most exhausting day of the VBS week, so we prepared for the day with all the energy we could get. During our morning, we learned more about what exactly the Christian church community should look like according to scripture. It was a good reminder to continue to encourage one another and help each other out during the week and to pursue the Haitian children with the same love that God gives us. Our daily Creole lesson immediately followed. ​We went down to the gate and met the excited faces of the children coming in. There are very few times in life that I've felt as loved as I have by these children. They always come up to us with huge smiles and take us by the hands into the church to sit next to them in the pews. Even though we can't have many conversations with them in Creole, they simply enjoy our presence throughout the day. I think they set such a good example of what pure love looks like. ​VBS was good today, and for some people it didn't feel as busy or chaotic as previous days, which really is a blessing with how busy we've been with one activity after another this week. Our craft for today was slingshots engineered by plastic cups and rubber bands. One cup represented God, and the other represented Jesus, and the launching action represented God sending Christ to Earth for our sins. The kids really enjoyed the craft and seemed to interact with it well. During our post-VBS meeting with the Haitian leaders, they agreed that today was a really successful day. 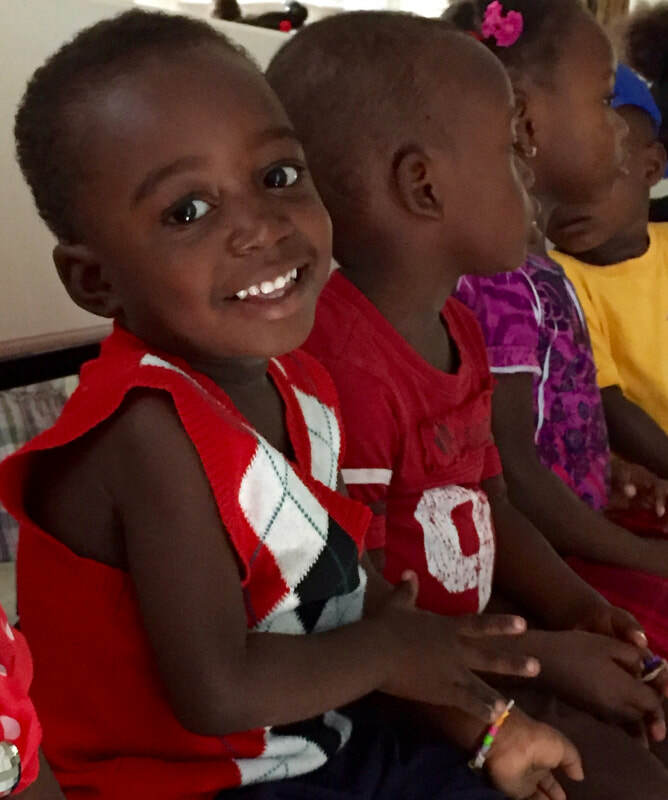 A really cool thing we've noticed throughout the week is how much pure joy the children show as they dance and sing songs at VBS. It's such a beautiful image to see so many kids excited to worship God together, and we feel super blessed to experience it with them. ​Our theme of community continued into our time with the youth. We had some nice discussion about what the Christian community should look like and how we can be initiators in building up each other in Jesus Christ ("Jezi Kriz" in Creole). ​We had the rest of the evening to rest back at the house and plan for tomorrow. It was overall a really good day, and I feel like our own team community has really been able to grow closer together during our evenings back at the house. We play board games, chill in the kitchen and the living room, cook meals together, and so much more. I'm so blessed to have the opportunity to be with this team this week and am excited to see what God will do for the rest of the week. Today we started the morning with a breakfast of champions (potatoes), which led into our daily devotional. The devotional was about the fruitfulness of Gods people and how we are only the "branches" dependent on God for our strength and growth. 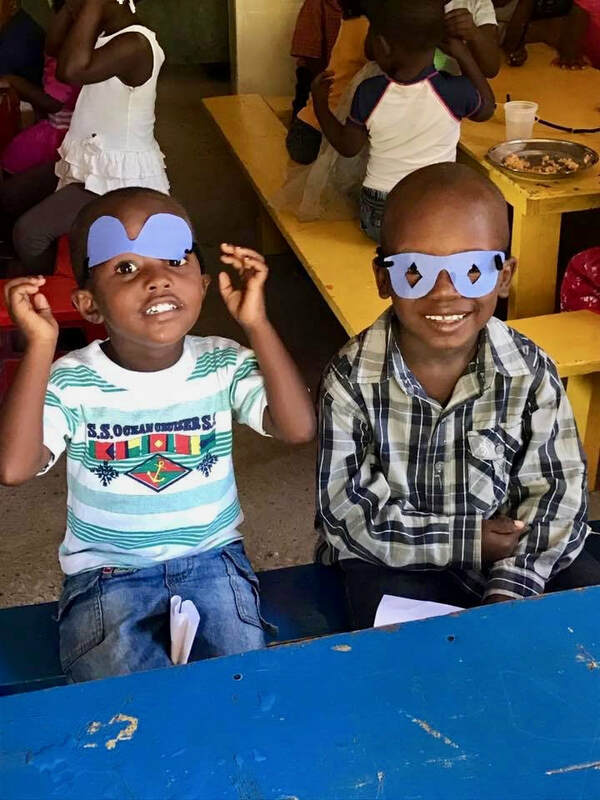 We followed the devo with more Haitian Creole lessons so that we would be at least a little more equipped to communicate with the children. We then went to the chapel for day 2 of Vacation Bible School. We greeted the kids at the compound gate and the pure joy on their faces was just as obvious as our first interaction with them. The only difference was that now we knew each others names so it was even more personal and precious than our first time meeting. The VBS felt a lot more orderly today since we all knew what to expect unlike yesterday which felt like chaos. Its amazing how God keeps showing up and moving in all of our lives. Their is a light and clarity in the chaos, and God is on the move. Today I was with preschool. They were a lot more chill than the older kids, but it was more challenging to interact with or play with them. They were adorable though and were still able to memorize the scripture. After VBS we had lunch with the Haitian VBS leaders and tried to learn more about each other. The youth group was in the afternoon and it was a great way to be vulnerable and share Biblical truths about the character of God with each other despite cultural differences and a reminder of the life we are called to as his followers. All evening the electricity was out so that meant no lights, air conditioning, or water. This made dinner duty difficult, but despite the less than ideal circumstances we were able to eat, worship and grow in community the rest of the evening. Thank you for reading this reflection, and we could use the continued support of your prayers. The day in Haiti began overlooking the sunrise coming over the foothills, praying for the peace of the Lord today. Over breakfast we discussed the love of children Jesus showed in Matthew 18 and Mark 10 as we prepared for the insanity of our first day of VBS. We pondered the humility, faith, and joy of children as we prayed for the same posture in our own lives. After breakfast, we had a creole lesson from our wonderful host, Mary Jane. Despite our constant desire to speak Spanish (yes...Spanish, for some odd reason) we are very slowly learning a language completely foreign to almost all of us. ​We walked down to the gate where many children ran up to us remembering our names from yesterday. We then went to the church to worship and let me tell you, nothing makes me tear up like tons of small children singing to our Lord with nothing but utter joy. After making fools of ourselves trying to teach the kids our songs, we split into our classrooms. The theme of our day was God created us to love Him and one another. We shared the creation story, made paper telescopes, telling kids everything they saw God had created, and joyously sang some more. After lunch and hearing all the kids recite the verses they has memorized today, they went home and we debriefed over lunch. It was the first time our team actually got to fully interact with the Haitians leading the VBS and what a fun time it was. We struggled to communicate, eventually figuring out that we all knew more basic Spanish than we did Creole or English! We talked about our lives and how the VBS had gone. Overall, it seemed like the Lord blessed us with a pretty great and smooth day. Post-lunch the middle and high school aged kids joined us for youth group and we got to share the Gospel and talk about how it has personally impacted our life in 2017. We had a real fun time as these older kids taught us Creole and proudly practiced the English they knew. The most encouraging part of the youth group occurred as we talked about how we want to grow closer to the Lord in 2018. We all shared a common desire to just walk more intimately with the Lord and to love those around us more. After sending the kids home and enjoying some homemade pizza, we gathered in the living room to enjoy community through ice breakers and worship. "'Truly I tell you, unless you change and become like little children, you will never enter the kingdom of heaven. Therefore, whoever takes the lowly position of this child is the greatest in the kingdom of heaven. And whoever welcomes one such child in my name welcomes me." Our day started bright and early with the rooster's crow and the sun just starting to peek over the mountainside. The first night in Haiti was unusually peaceful, most everyone slept well after the long day of travel. After all 19 of us ate some Chex and Cheerios around the breakfast table, we headed down to Living Hope Ministry's main church building and were greeted by a couple hundred smiling young faces, waving for us to come sit by them. Immediately our team dispersed and merged in with the tiny little bodies and tiny little hands that wanted to touch absolutely everything. Our hair, hands, toes, Bibles, faces, arms, bellies, everything! Turns out the Haitian culture involves much more physical touch than our own. It was a bit uncomfortable at first, but qucikly our hesitations began to vanish as we learned to laugh and simply say hi! Mainly because we couldn't undertsand anything anyone was saying... but their smiles said it all; we were officially welcomed into their family. During service, all of us experienced the joy and peace that comes with hundreds of hearts singing praises to our Bondye (our good God). Despite the language barrier, the sound of hearts worshipping was undeniable. The Spirit was so present that any worries and anxieties we had were put to rest for the time being. After service, we all went out to the courtyard and weren't given any instructions. All we knew was that here we were in Haiti, and here were a bunch of kids standing by us wanting to play. So that's exactly what we did. For hours... and hours... (keep in mind, it was about 95 degrees today!) Some of us learned some of their games, some played tag in the field, some taught the kids how to flip on a jungle gym bar, others just sat and let the kids explore. The amount of love we were shown from these kids was absolutely incredible. Despite all the verbal and cultural barriers, it seemed like we had made a hundred tiny little best friends. And some even took it upon themselves to learn everyone's name on our team! They're making me look bad... I don't even know everyone's name yet. After the kids went home, we had time to wind down and prep for the VBS that is starting tomorrow. Through food, fellowship, and some worship, we were able to reconnect with eachother. Everyone is on the same page.... we are ready for bed!! Today we saw God's incredible and unconditional love. We know that perfect love casts out fear, and we are nothing without love. So please join us this week in loving God, then loving those around us. We made it to Haiti and are safely at Living Hope Ministries where we've gotten to meet Mary Jane and Andris who are graciously hosting our team this week. Both flights went well and we landed to a surprise power outage at the airport. Not to worry, it was resolved quickly and the pilot landed us safely. :) Despite being here only a few hours, we're already seeing God move in the hearts of our team as many described the drive in as sobering and we all are seeing our need for the Lord. Tomorrow we will get to attend a church service and tour the facilities but for tonight, we all hope to get some rest and tomorrow see what God has in store for us!